The morning of August 10th dawned dull and cool in Dublin and although dark clouds threatened to dampen the area around Baggot Sreet, the Young Mercy Leaders arriving for the first day of their Pilgrimage to Catherine McAuley’s home brought with them the warmth and brightness of their energy and enthusiasm for Mercy. Registration went smoothly with everyone being welcomed with a true Irish welcome and the mornings proceedings began in the school hall with three creative ice-breaker activities. It was a great opportunity for the young people to meet and begin to get to know one another. Mary Reynolds rsm, Executive Director of Mercy International Association, then welcomed all present and gave them a ‘Cead Mile Failte’(hundred thousand welcomes) to Catherine’s home. She reminded us that what joins us together in a common bond is that we are all inspired by Catherine McAuley and it was this inspiration that sent us on pilgrimage to her home place. Mary hopes that we will be changed by the experience and that we will go back to our place of origin with renewed energy. She challenged us to ‘Be Catherine to one another’ and to enjoy the laughter, fun, joy, dance and camaraderie. The opening ritual began with the haunting refrain from Marcia Howard’s song ‘Ireland’s Daughter‘ as the musician’s sang and played ‘Wind and Water, Ireland’s Daughter set sail’. The young pilgrims were then called forth and they carried the symbols of the oceans they had flown across to get here – the Irish Sea, the Atlantic Ocean, the Indian Ocean and the Pacific Ocean. Very soon the hall was a colourful prayerful space and the Mercy Cross and lit candle completed the display. In turn, representatives from each school presented and explained a symbol of their school and became part of a web of connectedness which was forming on the stage of the hall. The first keynote speaker was Aine Barrins rsm, a Sister of Mercy from Ireland who works tirelessly to spread the story of Catherine McAuley far and wide. After showing the DVD, ‘Circle of Mercy’, Aine began her address by describing Catherine as a ‘someone to whom you could open your heart’. She reminded the young people gathered that Catherine loved the young and tapped into their generosity. Aine then went on to trace Catherine’s life from childhood and relate different experiences she had to the experiences of the young people. It was wonderful to hear about the ordinary experiences of Catherine’s life and to realise that it is through the ordinary experiences of life that we experience God. The conference participants then broke into different groups with some going for lunch, others having a tour of Mercy International Centre and others attending a selection of break-out sessions. Marilyn passionately believes that the ability to find God in the normal experience of life is the basis for all effective action for social justice. After the address, participants were given reflection questions to ponder on and then had time to discuss in groups of six. There was great energy in the hall and also an opportunity was given to ask Marilyn questions, which she answered with great honesty and passion. More breakout sessions followed and the evening ended with a Theatrical Performance called ‘Heart Centered in God – Mother Catherine McAuley, First Sister of Mercy’. 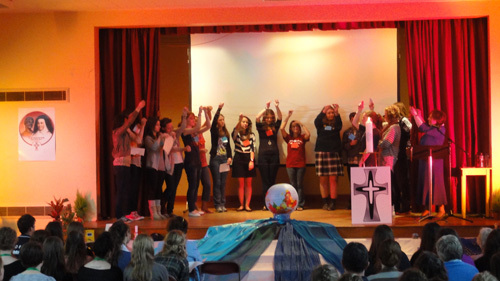 Read report of the Second Day of the Young Mercy Leaders Pilgrimage. Read report of the Final Day of Young Mercy Leaders Pilgrimage.